While thousands of Americans unleash their anger at big banks in protests around the country, many more are registering their dissatisfaction at their keyboards. In the wake of Bank of America's announcement that it is adding a new $5 monthly fee for debit card use, online-only banks are seeing a wave of new business. On Friday PerkStreet Financial had twice as many new customers sign up as usual. The next day even more users signed up. "The Bank of America news woke everyone up and spurred change,"
said Perk Street's CEO Dan O'Malley in a phone interview. PerkStreet, which launched in late 2009, is part of a new breed of online-only bank--all aiming to capture consumers looking to escape fee increases at more established banks. Bank of America (BAC) isn't the only institution to come under fire after raising fees. In a recent mailing to its customers Citibank said it would double the monthly service charge on EZ Checking accounts from $7.50 to $15, in November. Citibank said it has been encouraged by the response of its customers and is using the opportunity to help them understand the diversity of account options, including no fees on debit cards or online services, said Citibank spokesperson Catherine Pulley. On Wednesday, Bank of America's CEO defended the bank's new $5 fee saying the bank has a right "to make a profit." In contrast, a PerkStreet's no-fee checking account is free to open with a $25 minimum and earns debit-card rewards, including free coffee, music or cash. Online-only ING Direct's (ING) free Electric Orange Account earns .24% interest on accounts of up to $49,999. Free interest checking accounts at online Ally Bank have variable interest rates based on monthly balance, and no monthly fees. Big banks defend the new fees and hikes as necessary to recoup revenues lost due to recently enacted consumer protection laws, but the consumer zeitgeist is quickly changing, as evidenced by the Occupy Wall Street protests. O'Malley said he thinks this moment will be remembered as a turning point for consumer banking. The American Bankers Association is pointing the finger at government regulations as being a root cause of its fee increases, even as the general perception on Main Street is that the new fees are just revenue grabs by greedy bankers. 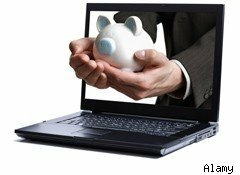 Brick-and-mortar banks are seeing large numbers of customers shift to online banking, which has had an effect on the popularity of branch banking. For the first time since 1995, the number of branch storefronts in the United States dropped last year, according to the American Bankers Association. A recent ABA survey showed that 62% of banking customers prefer online transactions -- a huge increase from the 32% who felt that way in 2009. Spokespeople at Bank of America and Citibank couldn't be reached immediately for comment for this article. Online banks like PerkStreet, ING Direct and Ally Bank, all face certain common challenges, such as how to deal with actual paper checks, and how to give a human touch to customer service. Customer reviews on MyBankTracker, an open forum for customers to review financial products, showed that deposit turnaround and customer service are two of the biggest sources of complaints for online banks in general. Catherine New is a staff writer at DailyFinance. You can reach her at catherine.new@huffingtonpost.com.